Journal of Nanjing Agricultural University, 2017, 40(5): 874-880. 赵富林, 徐明飞, 谢青云, 等. 大肠杆菌表达的RNA解螺旋酶Ded1p的提纯与解螺旋机制[J]. 南京农业大学学报, 2017, 40(5): 874-880. Abstract: [Objectives] This study was to express and purify DExH/D-box protein Ded1p, and further investigate the RNA duplex unwinding mechanism of Ded1p based on both traditional electrophoresis method and the single-molecule fluorescence resonance energy transfer(smFRET)technique. [Methods] The full length Ded1p was expressed in prokaryotic cells, and purified as target protein. Its helicase activity was verified. The 13 bp RNA duplex with a 3' overhang was fluorescently labeled as the substrate. Based on the total internal reflection microscope, the smFRET experiments were started by adding 800 nmol·L-1 Ded1p, 2 mmol·L-1 ATP/Mg2+ and fluorescently labeled substrate into the homemade sample chamber. And then, This study explored the double-stranded RNA unwinding mechanism of Ded1p at the single molecule level according to the data which were taken and analyzed by customized Matlab routines. [Results] We got a large amount of pure Ded1p protein with helicase activity after two-step purification:the affinity chromatography with Ni-NTA agarose and anion exchange chromatography with Capto-DEAE agarose. Based on the smFRET experiments, we realized the real-time observation of the unwinding process that Ded1p unwound the 13 bp dsRNA at the single-molecule level. Further analysis of the FRET change revealed that Ded1p directly unwound dsRNA, and took one-step as the main unwinding way. 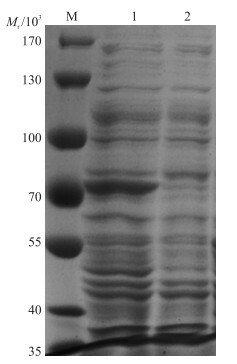 [Conclusions] The Ded1p expressed and purified from Escherichia coli had RNA helicase activity. The smFRET results were in agreement with the reported biochemical experiment conclusion, which proposed that Ded1p unwound RNA duplexes in a local strand separation mode. 图 1 Ded1p诱导表达的验证 Figure 1 Expression of Ded1p M.蛋白标准品; 1. 0.5 mmol·L-1 IPTG诱导16 h; 2.无IPTG。 M. Protein marker; 1. 0.5 mmol·L-1 IPTG induced for 16 h; 2. No IPTG. 图 2 Ni-NTA凝胶纯化Ded1p Figure 2 Ded1p purified by Ni-NTA agarose M.蛋白标准品; 1~20. 250 mmol·L-1咪唑洗脱液。 M. Protein maker; 1-20. Eluted by washing buffer with 250 mmol·L-1 imidazole. 图 3 Capto-DEAE agarose纯化Ded1p Figure 3 Ded1p purified by Capto-DEAE agarose M.蛋白标准品; 1.结合后流出液; 2~8、9~15、16~22、23~33分别为100、150、200和300 mmol·L-1 NaCl洗脱液。 M. Protein maker; 1. Flow-through after binding; 2-8, 9-15, 16-22, 23-33 were eluted by 100, 150, 200 and 300 mmol·L-1 NaCl washing buffer, respectively. 图 4 Ded1p解螺旋活性验证的电泳图(120 g·L-1PAGE) Figure 4 Unwinding activity of Ded1p(120 g·L-1PAGE) 1~5.以16 bp dsRNA为底物; 6~10.以13 bp dsRNA为底物。RNA以黑色线条表示, 6-FAM荧光分子以红色五角星表示。 1-5. Use 16 bp dsRNA as substrate; 6-10. Use 13 bp dsRNA as substrate. RNA was shown with black line, 6-FAM fluorescence was shown with red pentagram. 图 5 smFRET试验揭示Ded1p一步解开双链RNA Figure 5 smFRET experiment revealed that Ded1p unwinds dsRNA by one step A:试验设计, Ded1p起始解螺旋反应前后, 双链RNA底物构象发生变化; B:双链RNA底物的FRET分布直方图; C:起始解螺旋反应后的FRET分布直方图; D:起始反应后, 底物被532 nm激光激发时, Cy3和Cy5荧光强度的时间轨迹和FRET时间轨迹的变化。 A:Design, conformation of dsRNA substrate changes before and after Ded1p unwinds the duplex; B:The FRET histogram of dsRNA substrate; C:The FRET histogram of substrate after Ded1p initiates the unwinding reaction; D:With substrate excited by 532 nm laser, representative Cy3 and Cy5 fluorescence intensity time-trace(top panel)and FRET efficiency trajectory(bottom panel)after the reaction starts. Beckham C, Hilliker A, Cziko A M, et al. The DEAD-box RNA helicase Ded1p affects and accumulates in Saccharomyces cerevisiae P-bodies[J]. Mol Biol Cell, 2008, 19(3): 984–993.